Cadillac boss Johan de Nysschen couldn't respond to all of the questions, but he answered many -- and gave it back to some of the smart alecks. Jalopnik beckoned its readers this afternoon to “Ask Cadillac President de Nysschen anything.” They were more than happy to oblige. A day after Cadillac’s “Dare Greatly” advertising campaign showcasing the new top-of-the-line CT6 debuted during the Oscars broadcast, the oft-irreverent auto industry Web log scored an hour of the Caddy boss’ time -- a rare opportunity for Cadillac owners, luxury-brand enthusiasts, curious onlookers and even a dealer or two to get unfiltered access to a top brand executive. Johan de Nysschen was peppered with questions -- some thoughtful, some pointed, some tongue-in-cheek -- about the “Dare Greatly” campaign, the decision to move Cadillac’s headquarters to New York, its criticized pricing strategy, current product, future product plans, stunning concepts that didn’t make production, the brand’s naming conventions and more. How much response did Jalopnik generate with the Q&A? As of 2 p.m. today, 2 hours and 15 minutes after it went live, more than 380 comments. 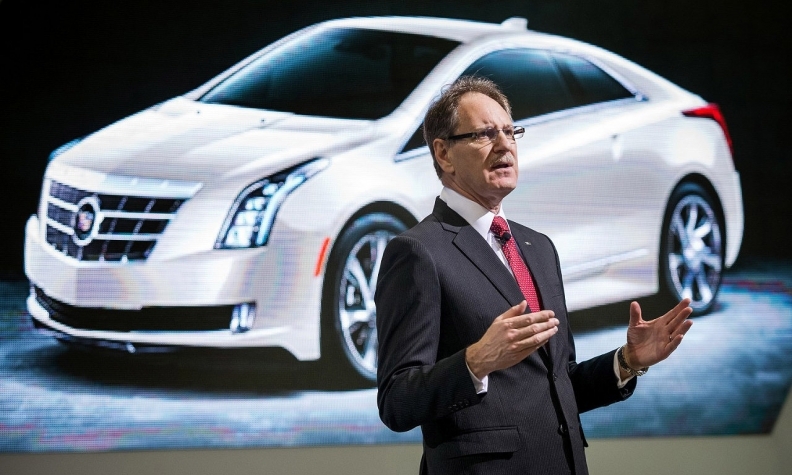 The passionate response underscores the marketing challenges facing Cadillac -- a brand whose most recent products have received critical praise but are struggling to compete against its luxury counterparts for demanding, brand-conscious customers. Cadillac, once the king of luxury for in the U.S. for decades, saw its annual sales fall 11 percent in 2014 amid concerns about overproduction and high pricing. Audi -- whose turnaround in the U.S. was engineered by de Nysschen -- passed Cadillac for the first time last year, making Caddy the No. 5 brand in the U.S. In addition, Cadillac’s line is narrower than those of BMW, Mercedes, Lexus, etc. It doesn’t have a small luxury crossover in what’s been a white-hot segment, nor does it have an entry in the small, niche wagon or convertible markets -- points responded to by de Nysschen today. It was clear today that Cadillac has people rooting for it, but many of them disappointed with the brand’s direction. To be fair to de Nysschen, he hasn’t been at the helm for long -- only since Aug. 1 of last year -- and he has made it clear that Cadillac’s turnaround won’t happen overnight. He saw further evidence today that he has his work cut out for him. De Nysschen deserves credit for putting himself out there. Not many executives of a struggling brand would expose themselves to potential ridicule that has become far too typical in such online forums. And, perhaps, this was an exercise in gathering the valuable marketing data he needs to get Cadillac back on track -- and back on people’s shopping lists. Here’s is a sampling of reader questions and de Nysschen’s responses. You can read the entire Q&A here. And, if you wanted to ask him anything, what would it be? The Oscars has a sophisticated audience, and it's a convenient opportunity to reach them. The new Cadillac brand campaign is a statement of our brand values -- it's about attitude, mindset and philosophy. It explains who we are and what we stand for. We are a bold and confident American icon with a proud heritage. We will continue to innovate and push boundaries and not shy away from taking risks. The CT6 reflects this attitude and we wanted to offer a tantalizing glimpse of the future. I don't really feel like explaining Infiniti's naming scheme, but I'll do it anyway. Q is for cars and coupes, QX for crossovers and SUVs. The bigger the number, the more expensive the car. Simple. As far as Cadillac is concerned, we are planning a dramatic expansion to the future Cadillac product range, and we simply could not find room to create names for these cars within the existing Cadillac naming convention. I'm very fond of Detroit. This is where I first came to when I moved to the U.S.; I even got married here. The decision to move to New York has nothing to do with my personal preferences. Quite frankly, I'd be quite happy to stay in Detroit, myself. We are establishing Cadillac as a more autonomous, separate business, and we need to create some space to the General Motors Corporation. If we don't have geographic separation, then processes and the way of doing business will not change and we run the risk of continuing to apply successful strategies aimed at mainstream brands to the Cadillac business as well. The majority of our operations will, in fact, remain in Michigan. We will have four-cylinder and six-cylinder diesel engines, but not before 2019. I think it's time that Cadillac gets a convertible back in the lineup, but it will take a few years. We are working on many different projects. Apart from you and me, and a handful of huge enthusiasts, there are not too many eccentric souls demanding a high-performance, manual-transmission wagon. So we have many other priorities. I'm pleased to remind that we are driving enthusiasts at Cadillac, and so ATS and ATS-V are available with stick shift. Awesome driver's cars!